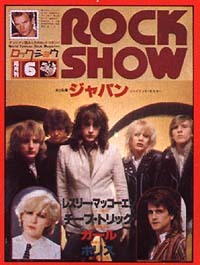 Japan on Japan, from Rock Show magazine. Translated from Japanese and previously published in the fanzine "Talking Drum"
By Steve - Rich is very shy. He doesn't easily have a conversation or laugh with other people. He's the silent type. His music style reflects that side of him as well. He'll hide his feeling within himself rather than express them. But we get along great and we tell each other jokes and have a laugh. For me, he is an important friend. By Rob - Sometimes I think my opinion of Rich is too low. He is usually quiet and doesn't laugh often. If you know him well, he may joke with you. He values his own private time. Also, he has no interest in material things. His technique as a keyboard player may not be the best but he has his own great style of producing sounds. By Mick - I think Rich is a born musician. In that sense, he's number one in the band. His style of playing doesn't come from well thought out calculation but rather that the sound be "born." It's like an accident. And he blends special feelings into his music. He's usually quiet but sometimes he gets moody; maybe that's his weakness. By David - The relationship between myself and Mick is like that of family, but the relationship between myself and Rob and Rich is like very good friends. When Rich was a student he had good grades. His personality is moody, a bit stubborn and somewhat conservative. I knew him when he didn't play an instrument and it was actually me who recommended that he play keyboard. He took a long time to master the techniques and he isn't yet perfect about it, but he's good at capturing the atmosphere of the songs. By Richard - When we were students, I didn't like him very much. I don't remember exactly why but we probably had some kind of fights. About two years after graduation I ran into him on a train. At that time he had orange hair. This encounter directly led up to me joining the band. Mick is really a unique guy. He's quite moody. He'll be happy one minute and then he'll be all quiet. Also, he has artistic talent, he's really good at sculpture. And he's handy about fixing things. By Steve - Mick's really funny, full of laughter. He's really energetic (on stage) regarding entertaining people but in contrast he probably has the most sensitive heart. When I met him I didn't like him too much but that's probably due to the fact that he's older than I am. But now that isn't a problem. When I have a problem, I go to him for advice and he'll try his hardest to help me out. He's my best friend. I think he understands me the most. By Rob - When I got together with Japan I talked to Mick most of the time. He's really a nice guy. He has good common sense. I think his personality is very like his mum's. Mick's sense of style is really different. He loves bright colours and he'll wear something nobody else would. His combination of colours is very unique but he looks rather good in them. I think he values privacy more than any other member of Japan. By David - When I met Mick for the first time I was 13. At that time Mick ws really a funny guy and made people laugh all the time. He was quite a clown. It took us a while to become really good friends and now he's like a brother to me, just like Steve. When people go through stages from purberty to adulthood, many changes take place, and we all went through them together, the strengths and weaknesses all together. I like him and I think we'll be together in the future. By Mick - It's been a long time since I met Steve through David, but now we are all like brothers. In reality, there was a time when we didn't know each other's name or face but I feel that we've known each other since we were born. Steve is my best friend in a different sense than David and I are best friends. It's really fun being with him. We tell jokes or kid each other all the time. And as a musician, he's one of my favorite drummers. By Rob - When I met him for the first time I thought he was a quiet guy, but now he's become more outgoing. Steve is the youngest member of the band but his thinking is mature and I don't feel any age gap between us. He's handy with his hands and is good at electrical things. He's really good at Space Invaders - I envy him! I like that game too but I'm no competition for him. He's really good at timing, including the music. He has a sharp instinct about things. By Richard - Steve and I have similar interests. It's really fun to be with him. He's a bit eccentric; sometimes he does things that are hard to understand. I really can't explain it well but he will start something strange, out of the blue, it's probably hard to imagine. Usually he's cheerful. He's a bit clumsy, he bumps into things a lot. On the other hand, he is surprisingly mature. Sometimes I think he is the most mature one in the band. By David - It's difficult to talk about Steve because we're brothers. Naturally we're very close. We rarely talk to each other in serious terms. Well, he's very sweet. Also honest, he's not good at lying, he has to tell the truth. Of all the people I know, he's one of the most honest. When Steve was a child he was mischievous, but on the other hand he was also quiet. We always played together and Steve always led when we did something bad. In school he was quiet and had very few friends, so he always played with my friends. By Rob - I respect his point of view and ideas. Also his songs are really powerful and full of originality. He has a great talent as a composer. He has self confidence and we can safely rely on him. He has all of our trust. He is usually very quiet but when I met him for the first time my impression was of someone who laughed a lot. By Richard - We've been friends for 6 or 7 years now. At one point we didn't see each other for about 2 years and after that blank period I was surprised to find a great change in him. David is very intelligent and mature in his thinking. When others are having problems, he will try to help them; he likes helping others. He might have a short temper at times but he's my best friend in the band. By Steve - When David was a child he was very quiet. He was also shy. I was more the opposite, I could be very loud. We were constantly together and kept apart from other kids. He is still very shy, also fragile and sensitive. But he won't come out with that side of himself. Others probably don't understand because because David hides everything inside himself. He loves to have fun and is very thoughtful to his fans. As a composer and vocalist, he's getting much better. I think he must be one of the great songwriters right now. By Mick - David is a very sensitive and emotionally rich person. He may look cold on the outside but can get very emotional sometimes. It's just that when he gets emotional he will try to handle it alone rather than focus it onto someone else. If somebody has a personal problem and asks David for help, he'll listen and try to help, even though the problem might be considered ridiculously silly by someone else. By David - Rob is well-mannered and he never argues with others. He's just like that. Also, he needs to do something all the time, he hates being bored. He reads a lot of books - everything from scientific journals to comic books. He also buys lots of records, goes to see films and draws pictures. I guess he likes to keep himself busy. By Richard - To be honest, I don't really know him that well. It's not very long since we met each other. He is a cheerful person and likes to keep himself busy all the time. He's quite different from the other four members of the band. We (the rest of us) don't really have many friends but Rob has many friends we don't even know. Also he is very knowledgeable about music and is a guitarist with a lot of originality. He listens to radio a lot and tells us how Japan has been reviewed. He's very nice. By Mick - I think Rob is the most innocent one in the band. He's like a child. He is quite sensitive if his actions or speech hurt or make others happy - isn't that like a sensitive child? Rob has that character in him. He's also an optimist. He thinks everything will turn out all right. He could get a bit lazy by following that philosophy because he lets things happen. I guess that's not a bad trait. By Steve - He's an outgoing person. He likes to meet people, go see films, go shopping. He's rather be doing something with others than be by himself. 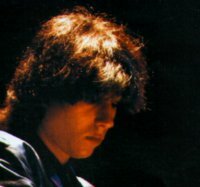 As a guitarist he isn't just an ordinary player. He has his own style. Rob is not a flashy, fast-action type guitarist, but rather he will push other members to the spotlight. We need a guitarist like that he and does that very well. Don't rain on my parade: web design and content © 1996 -2011 Paul Rymer unless stated otherwise. All rights reserved. This is a fan appreciation site and is not affiliated to any of the record companies who have released material by Japan. It has not always been possible to establish who the copyright owner is for all of the material on this website. Please feel free to contact the webmaster with any questions.